It is important to note that these tests are still in the research phase, yet have been highly successful in helping us to understand the extent and severity of several disorders of consciousness. Whether or not our tests are successful on an individual patient, it is important for family members to know that the information gained from this research will ultimately benefit patients and families in similar situations in the future. The particular MRI scanner that we use is not available in all hospitals. Many healthcare centres use a 1.5T magnet and the one we use is a (more powerful) 3T magnet. The examinations we perform are also different than a clinical MRI. We may use different tests to those that a physician might order for diagnostic purposes. Our assessments also tend to be much longer than a clinical MRI, so in order for a patient to participate they need to be able to lay quite flat for approximately 2 hours. A nurse, MRI technologist and members of the research team will be monitoring the patient during the study. This test looks at the activity of blood flow and blood oxygen levels that result from two types of brain activity: first, when a patient’s brain automatically responds to certain types of stimulation, and second, when a patient actively imagines certain activities in response to questions and directions. If we observe brain activity that corresponds to automatic responses, we infer some functionality in the brain regions involved in processing this information. For example, if a participant is exposed to an auditory recording of his or her name, and certain brain regions responsible for auditory recognition and language processing are activated, then it is likely that the brain regions responsible for hearing this type of auditory stimulus are intact. However, as the brain’s reaction to passive stimuli can often occur without the participant being aware—even in healthy participants—we are very cautious about drawing conclusions about awareness based on automatic brain activity. If, in the alternative case, a participant is able to imagine certain activities in response to the questions we pose, we infer that more sophisticated networks responsible for understanding questions, remembering instructions, and following tasks are intact. Responding to questions through the imagery task remains the best evidence we can provide of some level of hidden awareness in our participants. 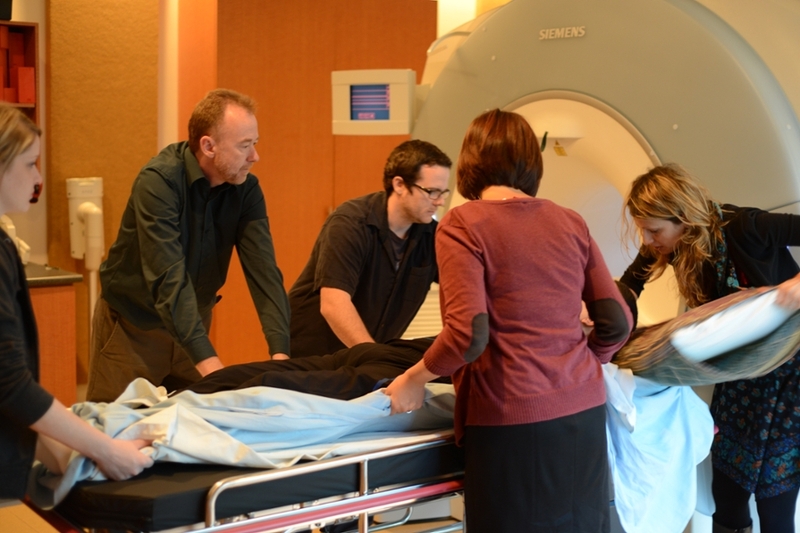 For more information on MRI please see our “About Our Research” section. EEG is a technique that uses sensors placed on the scalp to measure brain activity and has been used in hospitals for many more years than MRI. We employ a variety of stimuli in this test, including questions, tasks, and passive stimuli such as sounds. If we observe electrical activity in the brain that suggests that these stimuli have been processed, then we infer that the participant may have a certain level of awareness that is not appreciable through physical behaviour. Participants will never be required to engage in a test that poses any significant risk to their health or their family’s well being. The EEG will take place either at the patient’s place of residence or at Parkwood Hospital in London, Ontario. The MRI studies will take place in a well-equipped research facility at Western University. In both cases the appropriate specialist and medical staff will be on call should any emergency arise during testing. The instruments used in both types of research have been safely employed in various medical procedures for at least the past 20 years. The MRI scanner uses a large magnet and does not require participants to undergo other invasive procedures such as injections, surgery, ingestion of contrast agents or radiation exposure. 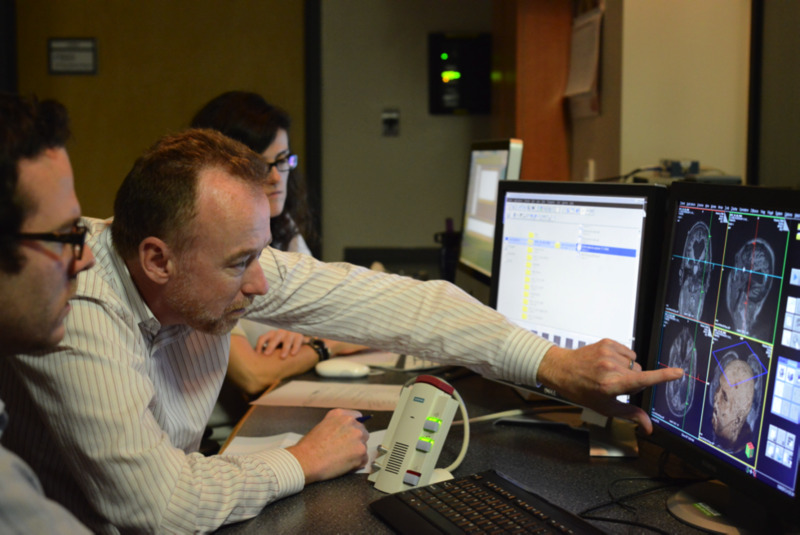 Participants are exposed to a magnetic field and are excluded from this test if there is any potential risk due to metal implants, or if they require breathing assistance, to prevent harmful interactions between the metal objects and the magnetic field in the scanning suite. Additionally, participants exhibiting stress or discomfort while lying in the scanner will also be excluded from the study to ensure their safety. 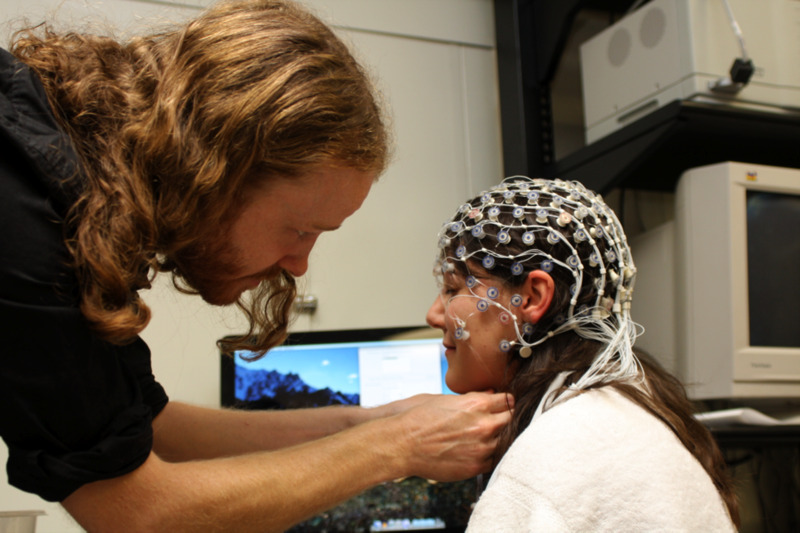 The EEG uses many compact sensitive sensors to passively measure electrical activity on the surface of the brain. These sensors are worn as a small cap and, like fMRI, posses little to no risk when used. Because fMRI studies will take place at Western University in London, Canada certain respiratory or cardiovascular conditions may prevent safe transportation. Though these conditions may exclude some participants from an fMRI scan, they may still be eligible for EEG testing. In every case, the safety of the participant remains our first priority. For us to be able to detect consciousness, the patient has to be not only awake, but also willing and able to follow commands. When and how will we receive the results? Unfortunately the results of these tests are not immediate. Once the appropriate information is acquired, we must analyze the data to ensure we provide the most accurate results possible. Moreover, this testing is still in the research phase, and unforeseen problems with data acquisition and processing may arise. On average, test results will become available in several weeks, though typically no longer than one month after participants have been scanned. Depending on the patient’s location, a visit or a phone call will be arranged to communicate the results to the family. A brief report will be written to the referring physician and a copy will be sent to the family. What does a response mean? A variety of conclusions can be drawn from responses observed in the participant. These conclusions are always dependent on the type of test we conduct and the brain regions we are focused on. In the best-case scenario, we can infer that a particular patient is able to understand questions, remember instructions, and carry out simply (imagery) tasks. It is difficult, however, to infer beyond this evidence to the presence of complex thoughts in participants with disorders of consciousness. Further procedures will need to be developed before we have a full understanding of the inner mental lives of individuals with these neurological conditions. Despite these limitations, it is important to recognize that such evidence shows that affected participants may be able to hear their family, understand what they say, and have thoughts and feelings in response to the presence of their loved ones. More importantly, such information will also be valuable for increasing our understanding of this patient population as a whole, and will likely improve the quality of life for similar participants and families in the future. Once a patient demonstrates consciousness, what then? It is very important to understand that awareness and recovery are two different things; detecting consciousness will not necessarily translate into functional recovery. Furthermore, we are a research group, not a therapy facility. What we are trying to establish is the basis for communication that will allow these patients to have a voice in making their life as comfortable as possible. What if there is no response, what does this mean? Though we make our best effort to develop a line of communication with participants, we are often unsuccessful in eliciting informative results during the course of our tests. However, a lack of a significant result should never be taken as evidence that they have no residual cognitive abilities. It is important to stress that a negative result of this type cannot be taken as evidence of ‘lack of awareness’. There are, for example, several factors that may prevent participants from responding even if they are aware of our attempt to communicate. Participants may not understand the questions we ask, the directions we provide, or may become tired in the course of the test. Instruments may not be sensitive enough to detect very subtle brain response, or may become disturbed if a patient moves during a brain scan. In these cases, we cannot rule out the possibility of awareness. We can only conclude that we were unable to find any evidence for awareness, rather than that we found any specific evidence for a lack of awareness. Because these tests are still in the research phase, there is often little change in medical treatment and diagnostic status when test results are returned. Decisions related to these issues are ultimately up to the discretion of the patient’s physician. Questions or concerns related to medical care and/or therapy should be directed to the office of the primary physician. Our tests are constantly evolving with the new information we gain from each participant. If a particular participant has shown promising results through the course of testing, we may ask the family to consider enrolling their relative/friend in future tests intended to reveal the extent and severity of their neurological condition with greater precision. We will contact families about this future research should it become available.